When it comes to picking a chainsaw, the three main options are gas, corded electric and cordless or battery-powered chainsaw. For homeowners looking for something portable for light tasks and occasional use, the cordless options are by far the best. 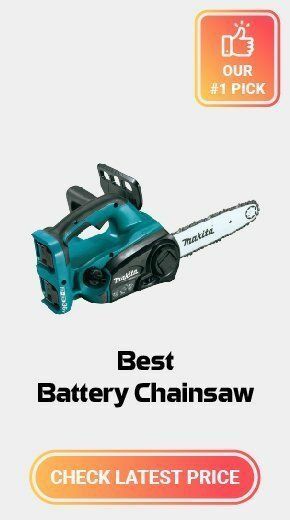 However, this is only true if you can choose the best battery chainsaw from the many options. These chainsaws are often also lightweight, provide a quieter operation and also tend to be way much easier to start than the gas-powered models. Choosing the best battery-powered chainsaw will require you to understand the different features that define them such as the battery, portability, and chain size. And in this guide, we provide more details about these features and also review some of the best cordless chainsaws. You can also read other chainsaw reviews such as top handle chainsaw, electric chainsaw, small chainsaw, cheap chainsaw, Greenwork cordless chainsaw, Husqvarna chainsaw, chainsaw sharpener, chainsaw chap. Picking just one chainsaw from the many top-rated cordless chainsaws is always a tedious task. However, our table below tries to make things easy by comparing 10 of these high performing chainsaws. Black & Decker seems to have an edge over most other brands when it comes to the manufacture of battery-powered tools. And their LCS1240 battery chainsaw does not disappoint. It is a powerful 40 Volts chainsaw with a 12-inch chain that will cut through small and medium-sized branches and limbs with ease. The low-kickback chain is also safe for the use, and it will cut fast and smoothly. The automatic oiling system ensures that you never have to oil the chain manually or worry about forgetting to do it. This chainsaw also has a tool-free chain tensioner for fast and easy adjustments. There is also a wrap-around bale handle that will provide better control and user comfort. And the relatively lightweight construction will make it easier to maneuver. The LCS1020 might not be the most powerful cordless chainsaw but it still does what it is meant to do efficiently enough which is to trim small branches and limbs. Like most other high-performing battery-powered chainsaws, it comes with tool-less chain tensioning for quick and easy adjustments, and overall it is also relatively lightweight and easy to maneuver. This chainsaw is also one of the most affordable models on our cordless chainsaw reviews and so you not only get a compact and lightweight chainsaw but also at a great bargain. Other features that make it a great chainsaw include the more efficient oiling system with a clear oil level gauge and the comfortable wrap-around handle. This 60-Volt chainsaw is one of the most powerful on our list and the massive power is what makes it a great choice for construction sites and most outdoor cutting applications. With the low-kickback 16-inch bar and chain you can cut relatively larger wood in just a few strokes. And despite the massive power, these ergonomic chainsaws are still quite easy to maneuver. And for that extra safety that many chainsaws users are always looking for, it also offers a chain brake for added protection from kickback. Tool-free chain tensioning makes adjustments easy, and the bar tightening knob makes it easy to get proper bar clamping force. And it also features auto oiling for even more convenience. The 56 Volts EGO Power+ runs on a highly efficient brushless motor that delivers a speed of up to 6300 RPM to make this a high-performing chainsaw that can tackle a variety of cutting tasks. This battery-powered chainsaw is also well-built with a weather-resistant shell to ensure that it can handle the tough outdoor conditions, and also to make it a long-lasting power tool. For safer operation, it uses a low-kickback chain and also has a chain brake to make it a safer power tool that is also relatively easy to control. And when compared to other chainsaws on our list, it is also relatively lightweight and it is backed by an impressive 5-year warranty. One of the most impressive elements about the battery chainsaws is that they are almost effortless to start but the DeWalt DCCS620B seems even easier to start as all it takes is a simple pull of the trigger. Besides the effortless start, this lightweight power tool runs on a highly efficient brushless motor that delivers a longer run time and is also highly durable. This powerful motor is one of the things that make this a great chainsaw for various outdoor cutting applications and construction. There are also other typical features that you can expect from a high performing chainsaw such as the bar tightening knob and tool-free chain tensioning. And it is a compact and ergonomic chainsaw which makes it easy to control and comfortable to operate. The best rechargeable chainsaws do not always have to be expensive, and the Earthwise LCS32010 proves this. Despite being the cheapest item on our list it is still one of the best battery chainsaws for lightweight trimming and cutting tasks. This 20 Volts chainsaw comes with a 10-inch bar and chain which might be relatively small but the size is still enough for cutting small and medium size limbs and branches. With the auto oiling system, you can also be sure that your tool will always be lubricated and there is also an oil level window to ensure you do not have to guess when to add more oil. Controlling and maneuvering this chainsaw is also quite easy thanks to the comfortable overmold handle. And you can always be sure of shorter downtimes as the LCS32010 comes with a 1-hour fast charger. Despite being an 18-Volt rated tool the Makita XCU03PT1 is still one of the most powerful cordless chainsaws on our list as it will deliver almost as much power as a 32 cc gas-powered chainsaw. The brushless motor is also highly efficient and the chainsaw comes with a variable speed trigger to make it possible to set the appropriate speed depending on the cutting task. The tool-less chain adjustment also provides convenient operation and also makes this an easy to use chainsaw. And if safety is your main concern, the XCU03PT1 also takes care of this. It does this with features like the built-in lock-off lever that ensures that chain never engages accidentally and the auto shut off capability. Most battery powered chainsaws with a brushless motor are always more efficient and high-performing and this is a good indication that the Oregon CS300-A6 will not disappoint you. Besides the powerful and efficient motor, this 40 Volts battery chainsaw also comes with a PowerSharp System that will sharpen the saw on the job and do it in just 3 seconds. The instant starting also ensures you never have to deal with gas-oil mixing, hard and annoying cord pulls or have to give the chainsaw some warm-up time. When it comes to the runtime, this is one of the best lithium battery chainsaw as the batteries deliver up to 66% more runtime. And the power tool also uses premium cell technology to provide constant and no-fade power. Other impressive features include the tool-less tensioner and an automatic oiler with a relatively larger 4.1 ounces tank. Worx WG322 is our lightest and most compact battery chainsaw and this means that almost anyone can handle and use it with relative ease. Although it has a small bar and chain (10 inches), this 20 Volts chainsaw is still very useful for a variety of cutting applications around the home. It also has most of the convenient and useful features that you would expect from any high-performing battery chainsaw, and they include the automatic and tool-free tensioning and automatic chain lubrication. The oil level indicator and battery indicator are also quite convenient as you will never have to guess when to change oil and you can also easily tell how much charge and run time you still have. With this battery-operated chainsaw, you will also not need to spend any extra coin before using it as it also comes with the battery and charger. Makita is one of the top brands that should be on your mind when shopping for the best battery chainsaw, and the performance of the SCU02Z shows why. The chainsaw is powered by two 18 Volts batteries that deliver up to 36 Volts to ensure you always get longer run times for more cuts on every charge. The instant start is also very convenient as all you need to do is to load the batteries and the chainsaw is ready to use. And with a noise rating of 89 dB, this chainsaw also guarantees less cutting noise. Makita gives the SCU02Z a rubberized top handle that makes this tool comfortable to use and also easier to maneuver. The tool-less chain tensioning is always a great feature to have in a chainsaw and it makes operation and maintenance of this battery chainsaw more convenient. While gas-powered chainsaws are the most powerful, they are also heavy, noisy, expensive and can also be quite messy. And it is because of this reason that many homeowners and occasional chainsaw users will opt to go for either the corded-electric or battery powered chainsaw. However, when it comes to choosing between battery-powered (cordless) and electric (corded) chainsaws knowing what defines them and the pros and cons of each is vital. The battery-powered or cordless chainsaw are the kinds that are powered by rechargeable batteries, and depending on the batteries that the specific model uses, they can give you anywhere between one and two hours of run time. These are highly portable chainsaws, unlike the corded electric models whose mobility is limited by the cord or the need to keep them plugged in. Also, the battery chainsaw is relatively quieter and this is more so when compared to the gas-powered models. However, the battery-powered chainsaws are relatively less powerful and are best suited for trimming limbs or cutting branches and other light-duty tasks. And the need to recharge the battery also means more and longer downtimes. As the name suggests, the corded electric chainsaws are the kind that will require plugging-in to operate as they use the electricity from your home as the source of power. These chainsaws will often come with a long cord to extend their reach but in most instances, users still need to get an extension cord for a good reach. One of their greatest advantages over the battery-powered chainsaws is the steady supply of power, and you will never have to worry about batteries running out of charge. Most corded chainsaws will cut harder and larger logs than the cordless types. They are ideal for cutting small trees close to the ground and slicing branches. The need to keep these chainsaws plugged-in makes them less portable, and the presence of a long cord exposes the user to the risk of tripping and it can also get tangled in a heavily wooded area and shrubbery. ​What to Buy: How you intend to use the chainsaw should guide you when it comes to choosing between battery-powered and corded electric chainsaws. As a rule of thumb, you should go for a cordless chainsaw when you want something portable and lightweight for light trimming and cutting small branches. And if you want something more affordable for heavier tasks around the house where there is a ready power source you can go for the corded electric chainsaw. Cordless electric chainsaws are a good option when you want a portable cutting tool for light and medium duty tasks. But, when buying one you will have to choose from several brands and models at some point. Unless you are a seasoned logger or landowner that already prefers a specific model from a specific brand, you need to know how to pick the best one for your needs. And this should be easy if you consider the following things. Since these chainsaws run on batteries, this is one of the most important factors to consider as it determines everything from the amount of power they generate to the runtime. When it comes to the battery, one of the first factors you need to take into account is the battery type. Here the two most common options are lithium-ion and nickel-cadmium (Ni-Cad). Lithium-ion batteries are the best option of the two as they do not lose power even as they drain discharge. And they also take less time to charge, unlike the Ni-Cad types that can take up to 12 hours to recharge. You also need to consider the runtime that the battery delivers and also the recharge time. The best idea is to go for a battery that delivers a long run time which is around two hours for the best batteries and the shortest recharge (typically 30 to 60 minutes) time for minimal downtimes. The top-notch and high-performing battery-operated chainsaws will have an automatic oiler feature which is very useful and convenient. An automatic chain oiler saves you the need to lubricate the chain manually and also eliminates the risk of breakdowns in case you forget to do it. The continuous lubrication from the automatic oiler system ensures that the chain runs smoothly at all times. Hence, a good cordless chainsaw should have this feature. Portability is one of the main advantages of battery chainsaws. But, just because these chainsaws are meant to be portable this does not mean they are all easy to carry around. To determine how portable a chainsaw will be before you buy it you need to check out its dimensions and weight. The compact and lightweight models are the most portable. But when it comes to the size, you should make sure that you do not go for something with a guide bar that is too small as it will only be ideal for small tasks. When it comes to the weight, these chainsaws will typically weigh between 6 and 12 pounds. And while the lightest models are the most portable this can also be an indication of smaller motor and battery. Hence you need to strike a perfect balance between power and portability. Cordless chainsaws might not look as tough and rugged as the large gas-powered models but this does not make them less dangerous. These power tools are still as dangerous as any other chainsaw type and so safety should be a top consideration when choosing one. Since kickback is still the greatest threat to your safety, it is vital to go for models with a low kickback chain or with anti-kickback feature as they are often the safest. Also, watch out for other safety features like chain brake and chain catcher as they help to make the chainsaw safer to use. Just like when buying any other power tool, the warranty is your best assurance the battery chainsaw will last, and it probably only comes second to the reputation of the brand. The length of the warranty will vary between brands but most reputable companies will provide at least a 2-year limited warranty. Battery powered chainsaws might not be the most powerful types but they make up for what they lack in power with portability and convenience. When it comes to choosing the best rechargeable chainsaw, you have to take into account several factors from power and portability to safety and warranty. And with our top 10 reviews for recommendations, all you need to do is to carefully compare the chainsaws using their features, pros, and cons and you will be confident of ending up with a top-notch model. Lastly, also remember to take good care of the chainsaw by regularly inspecting it for damages and also cleaning it where applicable if you want to enjoy its services for long.